"The Irish," I insisted to the black-haired young woman whose face might have belonged to a pre-Christian Celtic goddess, "are different. They look like some of the rest of us and they speak a language that's remotely like ours. Many of them even have the same names as we do. But they're different - almost like aliens from another planet." "What's her name?" Mom demanded happily. "Nuala Anne McGrail - the first name is short for Fionnuala. She'a a student at TCD, Trinity College, that is, studying to be an accountant but she acts and sings." This is the first book in the Nuala Ann McGrail series. It's like a cozy mystery series meets a good suspense series. I read this novel a few years ago at the suggestion from a friend's mother who just loved this books. I remember liking the novel but it's wasn't really my taste in books so I didn't read on in the series. 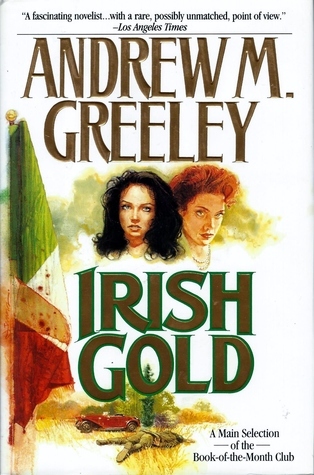 The thing that really interested me was that Andrew M Greeley was an Irish Catholic Priest from Chicago and he wrote A LOT both fiction and nonfiction and donated his earnings to the Church and other charities.